Hi pinups! It's been a while since I last posted on my blog, but there's been a good reason! This month me and my long term boyfriend moved into our first home together. Luckily we both have a taste for mid century furnishings and we've both been collecting vintage furniture for a long while now. It's so nice to finally bring all of our belongings together to start creating our home! If you follow me on Instagram, I've been posting about all the moving chaos along the way. Which of course includes dismantling my sewing space and re assembling it. Not an easy (or quick) task when you're simultaneously trying to run a business! But both mine and my partner's work-spaces are coming together and after only a couple of days we're starting to settle in. The first snap from our living room! 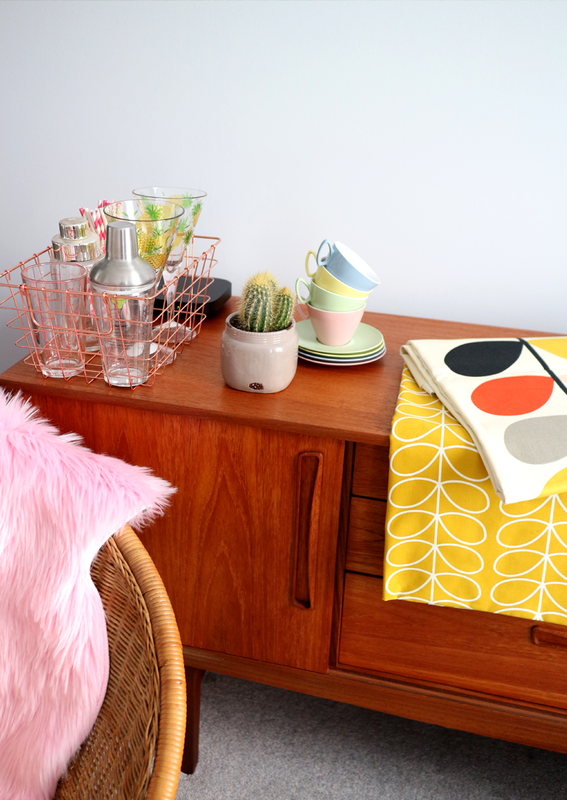 Whilst there is lots we have planned for the styling of our flat, with a sofa and desks on the way, we have a lovely corner featuring our original 1960s Nathan sideboard and wicker saucer chair, both of which we cleaned up to give them a new lease of life. 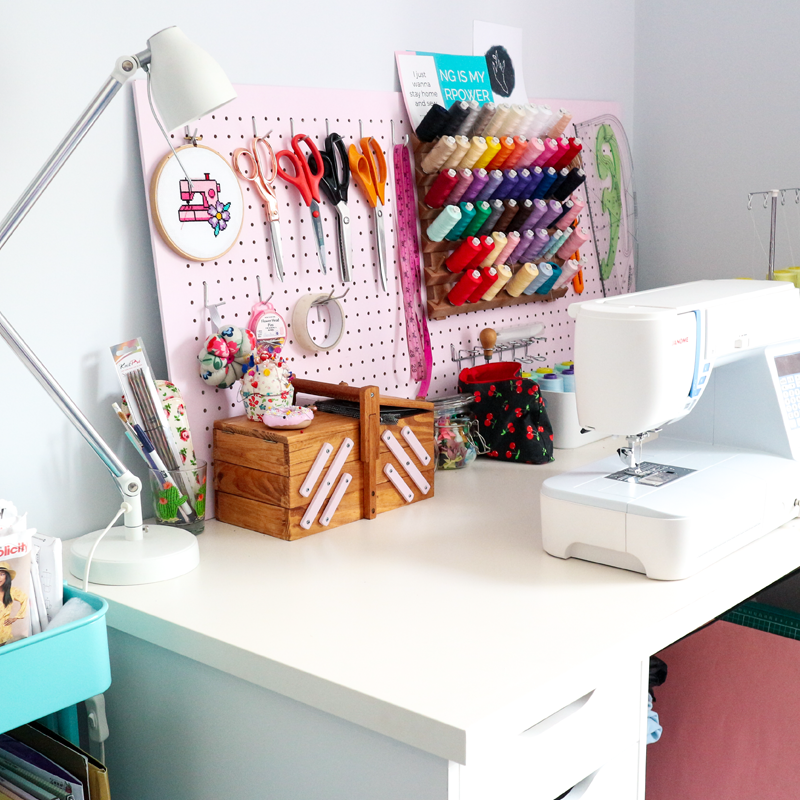 But I'm starting small and simple with my home sewing, with not a curtain or roller blind in sight! The lovely team at Remnant Kings kindly sent me some BEAUTIFUL Orla Kiely fabric which I've been lusting after for years. These stunning interior fabrics will bring the colour and print our living space needs in the form of large cushions, a table runner for the side board & few more small home sewing crafts I'm dreaming up. So that's all for now, I hope you enjoyed the first peek at our colourful new home. I can't wait to start sewing with the Orla Kiely fabric, although my hands might be shaking as I cut into it (it's too beautiful!). 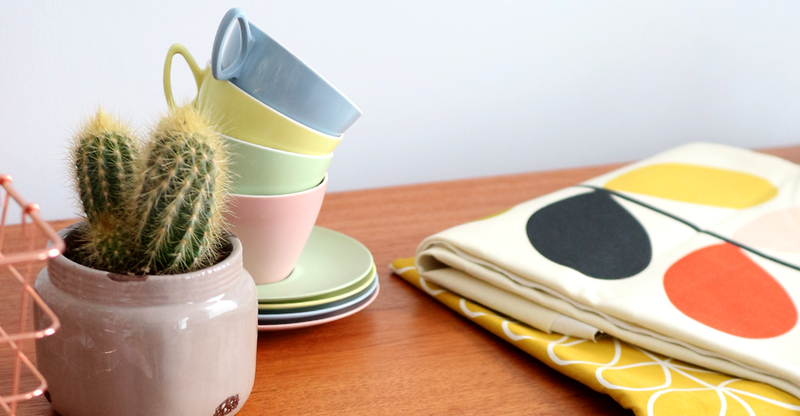 I hope you'll enjoy the new added interior and lifestyle direction my blog will be taking. P.S. I've had a redesign of the blog and stripped it back a bit for a simpler look. Disclaimer: Sponsored by Remnant Kings. All opinions are my own. Hi pinups! You know what time it is - it's Stitch by Stitch with Simplicity time! And this is the one I've been waiting for. You may have seen me say before, when it comes to Autumn/Winter dressing and sewing I sway towards the 1960s. Which has worked out beautifully for my next Stitch by Stitch series, all to celebrate Simplicity's 90th birthday but highlighting their vast pattern selections through the decades. I've been eyeing up this pattern for quite some time and when it came to choosing a 1960s project, I didn't have to think too hard! 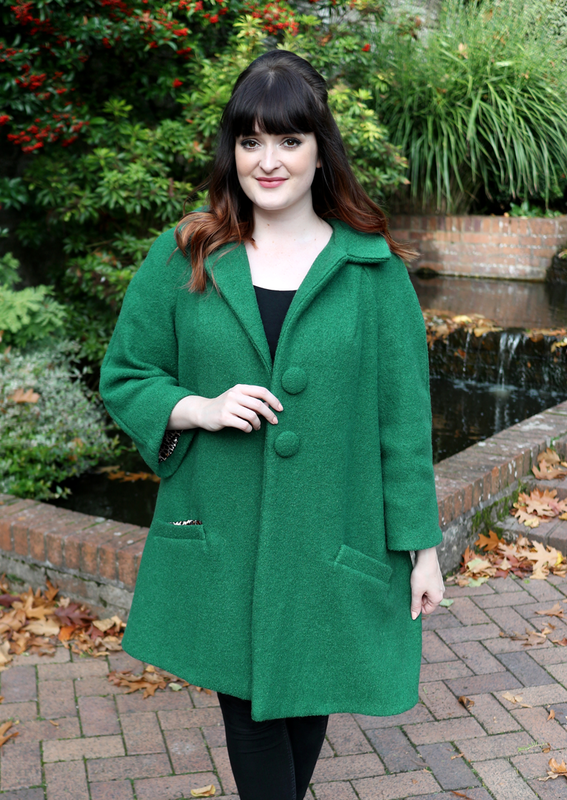 Whilst I love the array of simple shift dresses on offer, I fear they don't do too much for my figure, or have yet to be convinced anyway, but I'm obsessed with 60s style coats. I love the 'boyfriend' style fit, the swing styles, the 3 quarter length sleeves, the big buttons, EVERYTHING! 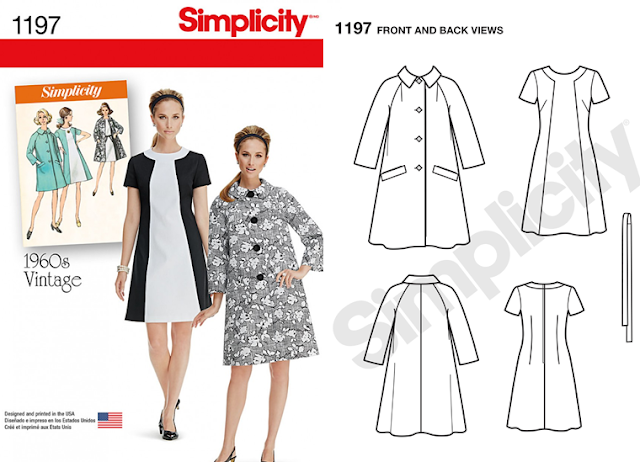 The Simplicity 1197 coat pattern ticked all my boxes. 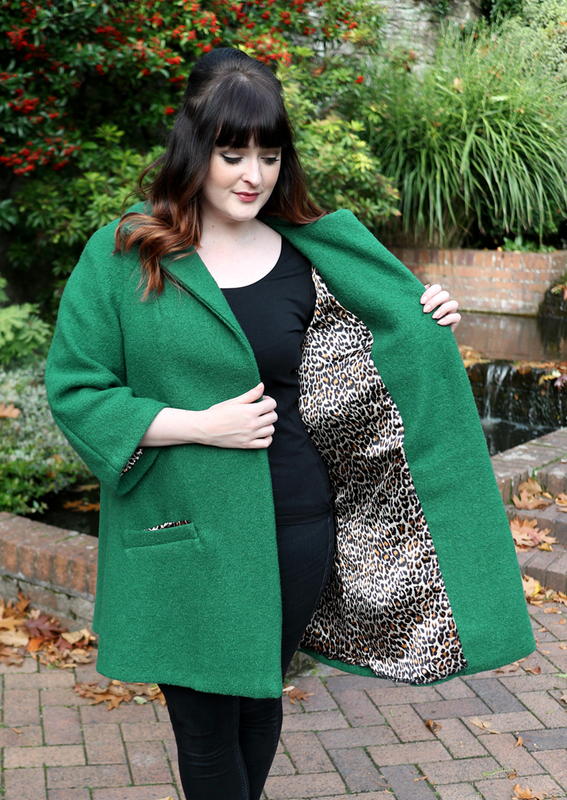 I teamed up with the wonderful My Fabrics to help make my 1960s coat dreams come true with an authentic emerald green wool, and what better to pair with than a luxurious leopard print satin. 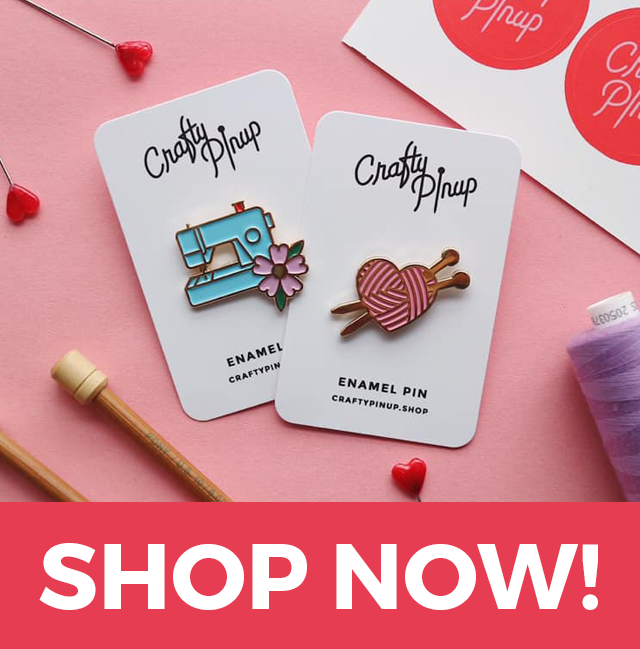 Use the code 'CRAFTY2017' at the checkout for £10 off orders over £60. This coat didn't come without it's hurdles, which I discuss in the video below. You'll also be able to see the coat come together during the sewing process, finishing with a close up look discussing the fit and details and an in depth pattern review. Sewing with this amount of wool fabric whilst trying to show you clear steps wasn't working too well for me. But I hope my review will still be helpful to those looking to sew this pattern. Whilst I think I did struggle more than expected sewing this coat, I'm blaming that on my stinking cold, slippery satin and stretchy wool.... Excuses excuses I know, but I felt the sewing gods were against me this week. 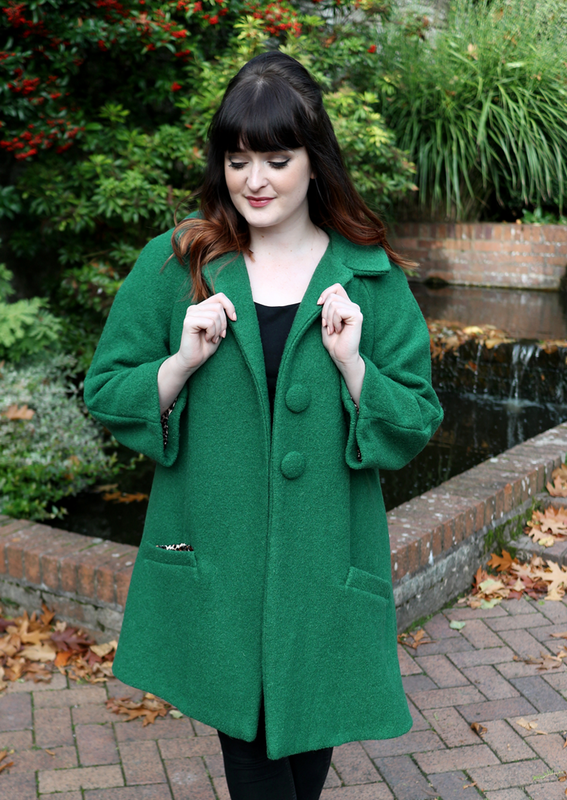 But every hand stitch was worth it and I'm over the moon with my finished coat. 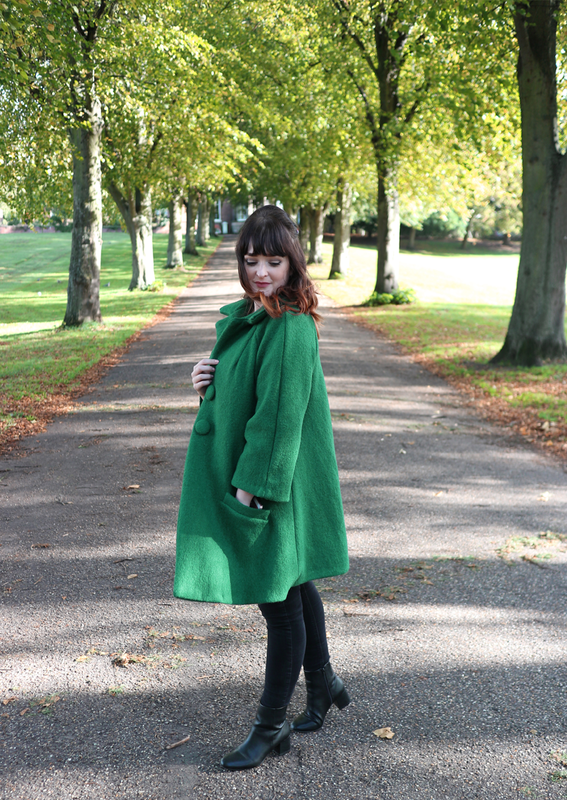 I love how to fabrics came together, I think they really make the coat look like true 1960s vintage. The shape and the fit is exactly what I wanted and I wouldn't change it. Notions: 2 x self covered 4cm buttons. Sewing time: A couple of days. Fit: Just what I wanted! Difficulty: Probably a lot easier with different fabrics. I'd recommend for confident seamstresses. Watch out for: Welt pockets, tidy collar, neat hem - there's a lot to pay special attention too here! Make Again? : Not anytime soon, this one was enough for me! Overall, I am in love with this coat. It has surpassed my expectations and whilst I may have had a bit of a tricky time sewing (which I'm blaming on my cold...) it was totally worth it. I know I'll get a lot of wear out of this coat and it will sure keep me nice and snug this Autumn! 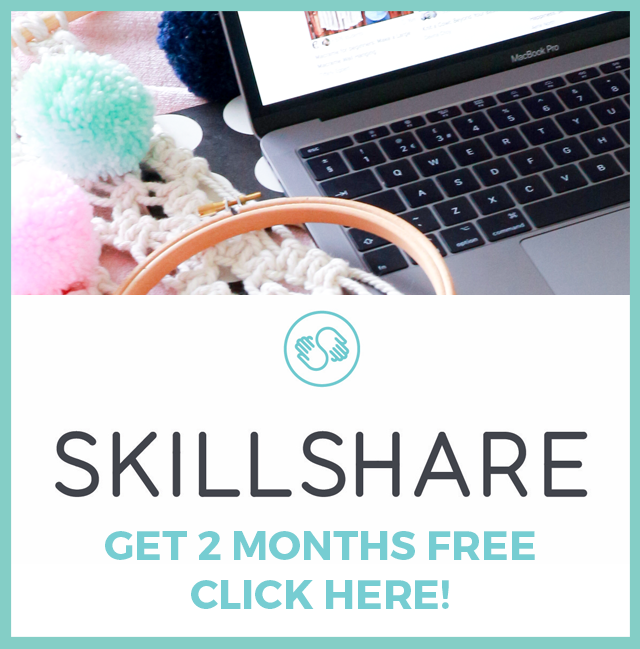 Catch up on my latest Simplicity posts HERE. Disclaimer: This post is sponsored by Simplicity and My Fabrics but all thoughts and opinions are my own. Hi pinups! 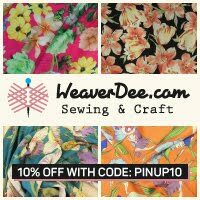 My blog has been a little quiet lately as my selfish sewing projects have been far and few between. 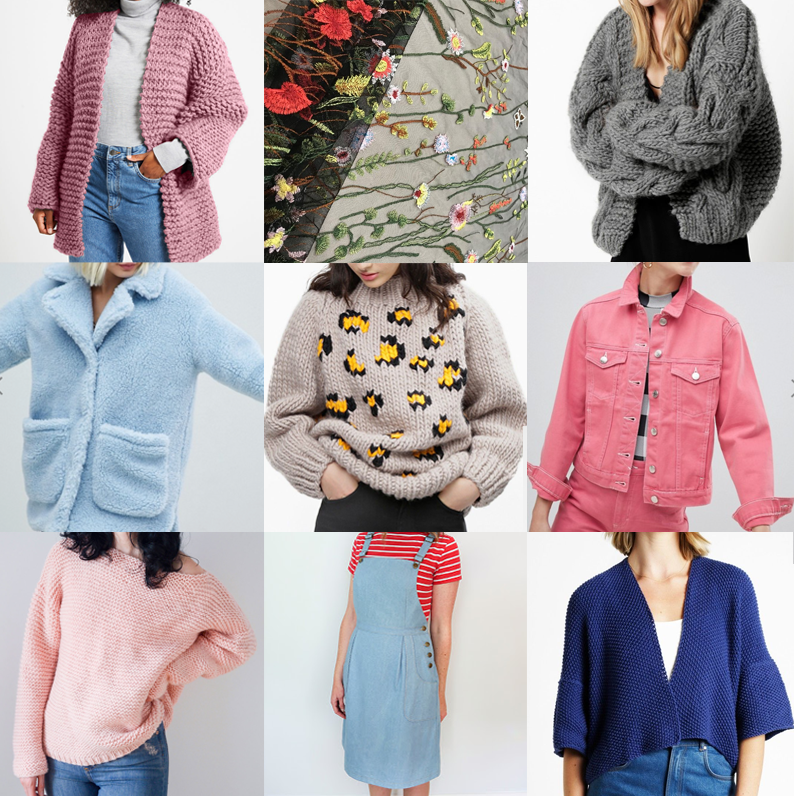 But even if I haven't been sewing for myself, I've sure been planning and the Simplicity new season sewing pattern releases haven't passed me by! I thought it would be fun to share my favourites from the vintage and modern collections and share some thoughts and plans! 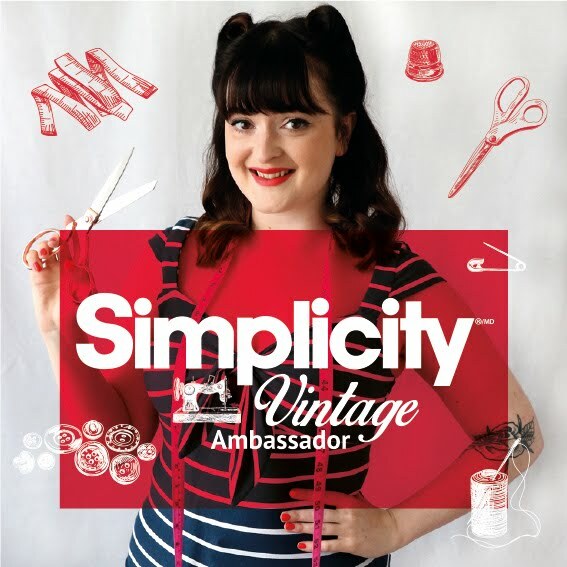 Below I've selected 3 from the vintage and 3 from the modern Simplicity new season pattern selections, you can see ALL the new designs HERE. Enjoy! The 8456 pattern was the first to catch my eye from the new season collections. I'm so glad to see more in the way of vintage lingerie and I hope this continues. There's a real lack of vintage/reproduction lingerie and nightwear patterns on the market and I hope this pattern will be a popular one! Not only is this a gorgeous foundation layer for full skirted dresses, it's a great base to make a tiered patio skirt and I think the possibilities for this pattern are endless and I'm actually really excited about it. Personally, I see myself sewing the skirt version to create petticoats out of chiffons with added ruffles for fullness, I see delicate lace trimmed versions and I definitely want to use the pattern to create a tiered dress. This is my top pattern pick of the bunch! I never knew how badly I needed overalls in my life until I saw this pattern. I've seen it's been getting some love online too and there seems to be a bit of a buzz about this one. I always find styling this type of garment for my own every day style a little tricky. Whilst I love vintage style, I like to wear the clothes in a current way and blend the eras. I find foot wear tricky with these overalls and I'm not sure whether I'd end up looking more 'workmen' than 1940sn landgirl chic. I'll be stalking this pattern on social media to look out for people's versions for now! Whilst I know this skirt pattern isn't particularly ground breaking, I'm still really taken by it. I always find dressing with a 1950s twist trickier in the Autumn Winter months, but something about this pattern made me think I could do it. I think this looks like a really great vintage skirt pattern with some nice design features. I'm also a sucker for the vintage illustrations! Choker everything seems very popular on the highstreet in the UK right now and whilst I'm not particularly a follower of current trends or do much high street shopping, this trend does appeal to my pop punk feels. I'm ignoring the trousers in this pattern and mainly focusing on the choker detail. I think this could be a really sassy, current looking dress or simple t shirt that people wouldn't expect you to sew. For me, this is one of those patterns that just calls to me and I don't plan on ignoring it! I can't resist a ruffle and this dress has it all! Part of me thinks it looks way too fussy with all those pleats but I LOVE the overall style. 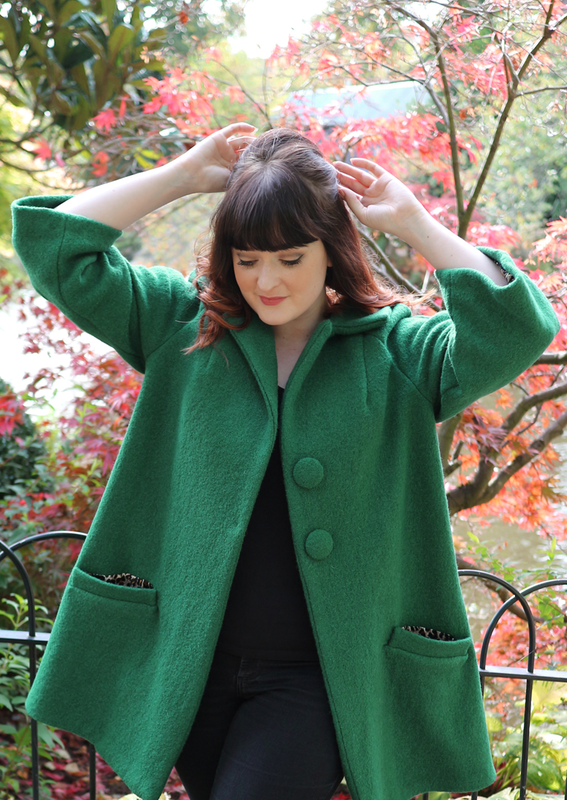 It's got some 1960s relaxed vibes and would look nice worn with tights and heeled boots for the colder months. Although I'm not sure if this style would do much for my curvy body shape, so again, I'll be stalking social media for some variations. I'm certainly a skinny jeans girl this time of year and I have a lack of pretty me-made tops. The 8454 top pattern has some lovely variations and there's that ruffle detail again! I love version A and I actually really like the real-life version on the model and the styling. I think it's very current compared to a lot of sewing pattern packaging. I think that this will be a great smart/casual pattern to have in my stash. So those are my new season Simplicity sewing pattern picks! What are your favourites from the new season? 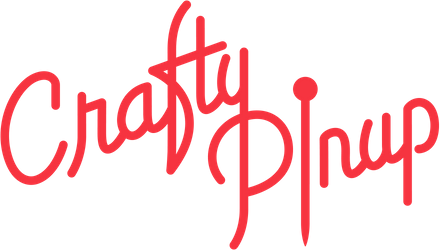 Will any of my picks be on your to-sew list?